This article examines the original manuscript, showing that the now-standard version of the song performed by early music revival players is not a true representation of the text and music, but the music itself poses many problems of interpretation. We begin with a translation of the Middle English words into modern English, continuing with a short survey of the social background and a step by step reconstruction of the music. Originally published in February 2016, this is a completely revised account, with a reworked rendering of the melody and a new performance video of Mirie, arranged for voice and medieval harp. In the Bodleian Library, Oxford, is a manuscript Book of Psalms, written in Latin on parchment, dated to the second half of the 12th century. It has not survived completely intact, and is now classified for posterity as MS. Rawl. G. 22, part of the collection of 18th century antiquarian Richard Rawlinson (1690–1755). In the first half of the 13th century, a few decades after the completion of the Book of Psalms, a torn page was added as a flyleaf at the beginning of the book. On this, in casual handwriting, was written the music and words to two French songs and the music and a single verse of what is now the earliest surviving secular song in English, [M]irie it is while sumer ilast. As you see on the right, the parchment is damaged by stains and holes in the body and by tears around the edge, but thankfully not so much that we can’t make out the words and roughly-written music. And ich with wel michel wrong. Soregh and murne and [fast]. The manuscript shows several visual differences to modern handwriting: an s looks more like an f; the equivalent of w looks like a y backwards; and what looks like a small d with a line through is an equivalent of th. Almost all modern sources spell the opening word “Miri”, pronounced with two syllables, but we see in the original manuscript that this is a repeated mistake: the spelling is “Mirie” and the music clearly has three notes at the same pitch for the word, indicating the pronunciation, “Mir-i-e”. The last word of the single verse is missing, presumably written on the lost next leaf of the manuscript, perhaps with further verses. This being the case, we cannot be sure either that “fast” is the next word, or that it is the last word of the verse, which may have continued for several lines more. The conjectural “fast” does rhyme with “ilast” and “blast” and fits the meaning and sense of the words. It assumes a rhyme scheme of ababbba, and such schemes with only 2 rhymes in a verse were standard in medieval poetry. and the weather is powerful. And I also am done much wrong. Sorrow and mourn and go without food. with sound of bird song. sorrow and mourn and starve. Click picture to play video – opens in new window. Mirie it is while sumer ilast, dated to the first half of the 13th century, performed on medieval harp by Ian Pittaway. The now-standard version doesn’t follow what was written in the original sole source, so if you’re familiar with the song from modern recordings, many of the notes, and indeed the opening word, “Mirie”, won’t be what you’re used to hearing. The manuscript clearly indicates the words in this recording, and most of the notes. Some notes are missing and are inserted editorially (as explained below), and the music was written in a casual hand with a pen that had a thick nib, so some of the rhythm is unclear and judgement is needed. Only the words and a single line melody survive, so the harp accompaniment is by Ian Pittaway, created using medieval musical principles. This is a revised interpretation of the problematic manuscript. 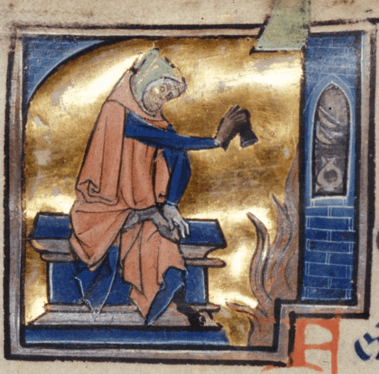 A man with two hoods, his inner hood keeping him warm, wrapped up in clothes against the cold, drying his shoe over a fire. An image from the month of February in a calendar, part of a French Psalter, Royal MS 2 B II, f. 1v, c. 1250, contemporaneous with Mirie it is. The two earliest surviving secular songs in English are both about the weather, the other being Sumer is icumen in, c. 1250, about the sights and sounds of summer. 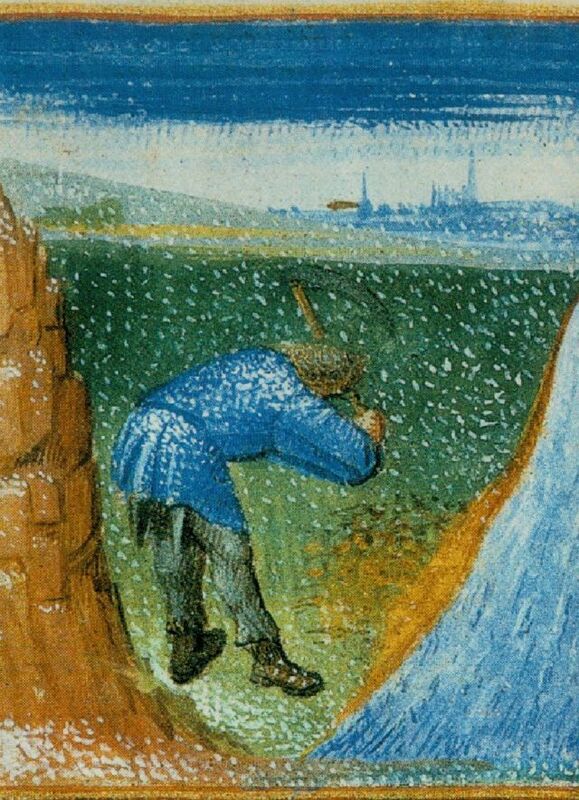 English people have a reputation for being obsessed with the weather, but consider this: in the 13th century the onset of winter was a concern for health and well-being, and could ultimately be a matter of survival. An inevitable part of medieval winter, with its short hours of daylight (“Ei ei what this nicht is long”) and freezing temperatures (“windes blast and weder strong”), was a potential lack of fresh food bringing a greater propensity for illness (“Soregh and murne and [fast]”) and therefore, among the least hardy, potential death. Fruit and vegetables were fresh in late spring to autumn, and fresh meat was more plentiful towards the end of autumn for one practical economic reason: feeding animals through the winter was expensive, so disproportionate numbers were slaughtered at Martinmas, 11th November. The carcasses not roasted and eaten straight away were salted to be kept for consumption through the winter. A similar situation existed with fish: long days of sunlight and calmer seas in summer brought the most plentiful catches; whereas the short days and rough seas of winter meant that most fish then available at market were dried and salted. So fresh food was entirely seasonal. A few root vegetables and some fruit could be kept in cold storage, such as carrots, turnips, apples and pears. Unground grain could, in theory, be kept all year round, though the danger of rot and mice was ever-present and, once ground, its storage time was severely limited. For those with enough wealth and surplus to preserve food, there were several means of doing so: salting meat, for those who could afford the expense of salt; drying or salting fish, for those who could afford the high price of fish due to the cost of transporting it inland; pickling fruit and vegetables; and the turning of milk into cheese. What was preserved, and one’s means to preserve and store it, depended entirely upon one’s social class: the affordability of meat, fish and salt, the availability of storage, and the financial possibility of surplus to preserve. Following the Norman conquest of 1066, English life was lived in the context of the feudal system, with its interconnected possession of power, land, money and military might concentrated in the hands of the hereditary land-owning warrior aristocracy, the ruling 1–2% of the population. Attached to them were the vassals, permanent tenants of the lord of the manor, obliged to serve and protect their lord and be prepared to fight for him in battle. Next down the social hierarchy were rent-paying farmers, tenants known as freemen since they owed little or no service to the lord. In England they constituted the most fortunate and well-off 10% of the general population. The rest were unfree tenant farmers known as bondmen, serfs or villeins. Not only were they not allowed to own land, they were themselves owned along with the land they worked, so that if the manorial lord sold land he thereby sold the unfree tenant bondmen with it. All food the bondmen produced for themselves on the small plot they were allotted belonged legally to their lord; they were not allowed to leave the manor for more than a day; the lord had power of approval or refusal of their marriages, and he could even force marriages if it suited him to have land worked by a forcibly-married couple rather than left fallow. Their conditions of life can therefore only be described as slavery. Social class was hereditary, so there was no chance of escaping from the bottom of the pile except by being made free by the beneficence of one’s lord or by successfully running away and hiding for a year and a day, thereby losing all one’s possessions from the manor but gaining one’s legal freedom. How the 1 or 2% lived: the aristocracy dressed for throwing snowballs. 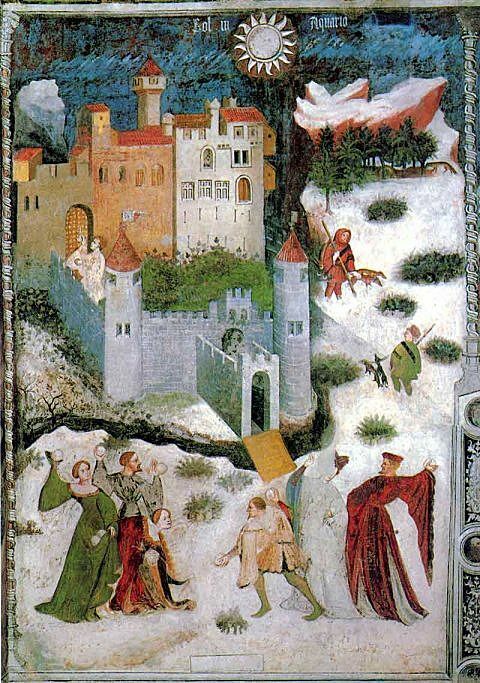 This is January, from a fresco representing the 12 months of the year, at the Castello del Buonconsiglio, Trent, Italy, dated 1405–1410. What is now commonly called ‘the peasantry’ were by no means always passive accepters of their lot. After the legal classification of free and unfree in c. 1200, roughly contemporaneous with Mirie, individuals who were newly unfree challenged their categorisation in the royal courts. Whole communities brought lawsuits against their lords when rents and demands on their services increased. These services could include extra labour and the giving of food that bondmen had grown for themselves. The royal courts nearly always found against the complainants and manorial lords punished them for daring to protest, but protests did continue. Some modern commentators suggest the protests helped draw a line against the worse excesses, since village life necessitated social and economic co-operation between lords and their workers. Personally, I find this romantic and fanciful: those with power wield it, defend it, and do not give it up without a struggle: the more likely outcome is that those without legal or political power on their side, defeated, found the struggle against the nobles too hard to continue. So, on the political level, all food security depended on social class, as this dictated ownership of land, levels of disposable income and distribution of food. Meat was largely the food of the rich, seldom tasted by the rest of the populace except by hunting game and wild animals, which was, on the whole, permitted only for the lord of the manor. The staples of the common diet were bread, pottage (variously white porridge of oats, green pottage of peas and white porray of leeks) and vegetables. Thus, when there was a food shortage due to a poor harvest, it affected the poor disproportionately. Scarcity raised prices and, at such times, the rich could afford expensive imports beyond the means of the poor. While the majority’s largely vegetarian diet was healthy, it was necessarily unbalanced and uneven due to eating a mostly seasonal diet, and reliance on it made them more heavily dependent than the rich on a good harvest, lacking as they did the ability to afford meat, fish, or salt to preserve it, or generous storage space for surplus. Between 1315 and 1317, a century after Mirie it is, a succession of three wet summers created a famine in which upwards of half a million people died. This caused a further crisis in uncultivated land due to a shortage of surviving healthy labourers. Seasonal under-nutrition inevitably weakened health, creating greater susceptibility to disease and thereby shortening or ending the lives of the vulnerable. Lack of fresh fruit and vegetables for large parts of the year, particularly in the dark, harsh winter months, resulted in a high incidence of scurvy, the result of vitamin C deficiency, causing swollen, bleeding gums and the reopening of formerly healed wounds. It is no wonder, then, that the writer of Mirie it is didn’t like winter and looked back to happier summer times. The very fact that it was expressed this way may give us clues about the composer’s identity. Due to lack of evidence we cannot state a specific social status with any certainty. We can be sure that the composer wasn’t a bondman, serf or villein, since they were always illiterate, so we have to consider a status of freeman – or indeed freewoman – or higher. The law presumed male superiority, with women legally an extension of their fathers or husbands, but we cannot assume the Mirie composer was necessarily male: while women were of an inferior social and legal status to men, nunneries educated as many girls as boys and townswomen were often literate. I think it is fairly safe to say that the song’s expression of worry about the vicissitudes of winter probably means the composer was not of the highest social strata, was sufficiently socially elevated to be literate, but not so elevated that the experience of winter did not include familiarity with privation. In medieval square notation, clefs were movable, using either a C clef or an F clef to indicate the relative position of all other notes for a given piece of music. The point was, as far as possible, to keep all notes within the 4 or 5 line stave, avoiding ledger lines. There follows 4 neumes or note values, their duration indicated by shape. Since there were no bar lines or time signatures, rhythm was indicated by the notes’ relative value to each other. In modern notation, quavers and shorter notes are joined by a line or ligature to group them, to help the reader interpret the rhythm of the music. In a similar but not identical way, neumes may be joined in groups to indicate a melisma (plural melismata), a single sung syllable lasting two or more notes. This is indicated by neumes touching or placed vertically joined by a line on the right side to indicate rising notes or on the left to indicate falling notes, as we see above. In the facsimile on the left we see groups of melismatic neumes touching from the Miller Nichols book, containing Gregorian chant from the 10th to the 16th centuries. On the right we have the same principle in Mirie it is, written in a much rougher fashion, but still readable. Music notation evolved and different systems were used in different locations and at different times. The system of Franco of Cologne, described in his Ars Cantus Mensurabilis (The Art of Mensurable Music), written 1250–1280, was popular during the 13th and 14th centuries and is now known as Franconian square notation. The Mirie scribe, in the first half of the 13th century, appears to have attempted to use a type of mensural (rhythmic) notation, which we could call proto-Franconian, recognisably similar to the notation in other surviving English songs of the period, such as the Latin Magno gaudens (With rejoicing), written 1180–c.1230 (about which an article will appear soon on this site) and the Middle English Man mei longe him liues wene (Man may long life expect to gain), c. 1250 (about which an article will also appear soon). The opening lines of, from top to bottom, Magno gaudens, 1180–c.1230, Man mei longe, c. 1250, and Mirie it is, first half of the 13th century, showing the same or similar styles of notation. Even a glance at the Mirie manuscript makes the problem of interpretation obvious. As with the English love song, bryd one brere, c. 1290–1320, the scribe used a poor nib, making the shapes of some of the notes rather indistinct, and the manuscript is in a poor state, with tears and holes. The use of a poor pen is of much greater significance in medieval than modern music, as the shape of a note indicates its value, so if the shape is difficult to discern we’re left to infer its value from the musical context. It is the ambiguity of the notation that is the fundamental problem. Add that to the fact that so many players of medieval music do not read medieval notation, but rely on others’ interpretations, and we have a situation where there is now a standardised version of the song which, I will show, does not represent either the music or even the words in the only surviving version of the song. Because of its ambiguity, it is not possible to give a definitive version of the song, so while I will show that the now-standard version is erroneous, I cannot claim that my interpretation is completely accurate. Indeed, this revised article has a different interpretation of the music and new video: we don’t have a way of knowing what notational accuracy looks like for this piece of music. This article was first published in February 2016. In August 2018, preparing to give a workshop on Mirie at Medieval Music in the Dales, I went back to first principles with the manuscript, deconstructing my own work in order to present it to others. I then realised, coming to the torn and battered music afresh, that I interpreted and understood what the notation was indicating in a new way, and couldn’t see it in the way I originally had. We’ve probably all had the experience of staring at dots until we see the image hidden within it, and we know that some people just can’t see it; or we’ve seen those deliberately ambiguous images – is it an old woman or a young woman, a duck or a rabbit? – and we know that some people can only see one and not the other. My experience was akin to that: with my fresh eyes I couldn’t get back to my original interpretation, which was clear at the time! Such are the severe difficulties of this song. I think this second attempt is probably more in keeping with the scribe’s intent, and more based on well-established theoretical principles of medieval music – though it is impossible to prove the scribe’s original intentions beyond doubt. The first interpretive step is a literal translation of Mirie it is in modern notation. Some note values are best guesses, since some shapes are indistinct and, because the handwriting is inconsistent, it is unclear whether some lines are marks on the page or part of the note. These marks have been taken as part of the note. Bar lines represent the end of a line in the original manuscript and rests represent holes in the page where notes are missing. Longs are written as crotchets and breves as quavers. Quavers are written single or grouped according to whether they are single or grouped in the original notation. Below is a second version. Where it is unclear whether lines are marks on the page or integral to notes, here they have been taken as unintended marks on the page, as distinct from version 1. Bar lines represent the end of a line in the original ms. and rests represent holes in the page where notes are missing. In my view, this second rendering takes us away from something musically meaningful, but the first is not performable in its raw state, either. Taking the first version as our starting point, we need a guiding principle. In the Mirie manuscript and in all medieval music, there are neither the bar lines nor the time signatures of modern notation. The time signature tells us how many beats there are in a bar, whereas the underlying pulse in medieval music is indicated by other means. The Notre Dame school of polyphony flourished from c. 1160–70 to 1250. Of their composers, only two names survive, Léonin and Pérotin. An anonymous member of the school wrote De mensurabili musica (The measurable music) in 1260, the first to describe six rhythmic modes. In ecclesiastical melismatic music (with syllables sung over many notes), the mode was indicated visually by the way the notes were grouped using ligatures, indicating rhythmic accent, as we see demonstrated in the music written by Léonin. The modes give an overall underlying pulse, but of course the actual rhythm of the notes could be changed for a particular phrase. The modes were as follows, together with rhythms in modern notation. There are two technical details to bear in mind. Firstly, the modern notation given above shows relationships between note values, not literal note values, so the first two modes could also be rendered minim crotchet and crotchet minim respectively. Secondly, from the mid 13th century, a long could be worth two breves, akin to the rhythm of today’s 2/4 or 4/4 time signatures, or three breves, akin to today’s 6/8 or 9/8. The proportion of 2:1 was known as an imperfect long, 3:1 a perfect long. Longs and breves respectively always look the same on the page, though their actual values are different depending on the imperfect or perfect proportion, which is read from the musical context: 2 breves together of unequal value are always read in the order imperfect perfect, i.e. longs worth successively 2 breves and 3 breves. The same principle is applied to 2 successive breves of unequal value, breves worth successively 1/3 and 2/3 of a long. In my judgement, Mirie does not conform to any of the ecclesiastical rhythmic modes. The neumes do not indicate any of the 6 Notre Dame pulses, and forcing them into one of these rhythms (as the now standard version does) is contrary to what is written on the page. Detecting an underlying rhythm would be crucial to help discern what some of the more indistinct-looking note values may be but, in this case, we cannot look to Notre Dame to help us do this. Rhythmic modes can be helpful in giving shape to a secular melody written non-mensurally, but the method itself has problems. In early music debates there has been a great deal of controversy over whether these modes apply only to the polyphonic melismatic ecclesiastical music for which they were explicitly intended or also to monophonic secular music of the period. In other words, it is a question of whether the rhythmic modes were only part of the musical life of the church or a reflection of music-making generally. I would argue that the more useful question is not whether church rhythms were always or never used in secular music, but whether they were sometimes used. The answer seems clear to me. The writers of secular music were trained in the ways of the church. In the education of the time, the church was the only show in town. Unless we are to argue that all secular music was universally without a rhythmic pulse – an argument that is musically odd and for which there is no evidence – then some melodies outside the church’s jurisdiction must have used some of the same rhythmic patterns used by the church, but without necessarily thinking of them as ecclesiastical modes: the church had no monopoly on rhythm. And it is equally possible that some secular music used underlying pulses that were outside the ambit of the church and the Notre Dames school. This debate has aroused great passion among modern early music theorists, but lack of evidence means that definitive answers are not possible for any particular piece of non-mensural secular music. So let’s assume, then, that the music of Mirie was intended to be read mensurally but that, since mensural notation was in its infancy, the scribe notated rhythm inconsistently, sometimes mixing up longs and breves which can, let’s suppose, be retrospectively discerned in relation to the underlying pulse. On this basis, let’s take the first 4 notes of Mirie it is, on the notes “Mir-i-e it”, as an underlying pulse of longs. This pulse gives us the context for deciding how to interpret a long or breve that is rhythmically out of place. It now becomes clearer how to fill in the missing notes. The first and second phrases are not identical, but they are clearly related. The missing notes in the second phrase can be taken from their related position in the first phrase. There are 2 words of 2 syllables each in the first phrase – “while sumer” – in the place where there are notes missing for the syllables “-cheth” of “necheth” and “win-” of “windes” in the second phrase, 1 syllable each. To maintain consistency in the supposed underlying pulse, the notes on “-cheth” and “win-” must take twice the time value the second time, shown below as quavers in the first phrase and crotchets in the second. Similarly, the first 2 syllables of the 3 syllable word “fughe(les)” in the first phrase take up 2 longs (crotchets) on the same note, whereas when that point repeats on “we-” of “weder”, it needs to become a double-long (minim) to take up the same space in the phrase. Again we find non-identical near-mirroring in the third and fourth phrase, the general arc of the melody being repeated but not note for note, enabling us to fill in the missing note with some certainty. In the standardised popular version of the song (about which more below), the missing last note is given editorially as g’, presumably because every other phrase ends on g’, but this seems to me to be a mistake. Medieval melody was built on the principle of consonance – dissonance – consonance, i.e. beginning with resolution, going through irresolution, then ending with resolution. Non-final cadences typically end on non-resolving notes, final resolution coming only at the end of a melody. Therefore, on medieval musical principles, it does not make sense to me for all 5 phrases of this song to resolve with the final note, nor does it make sense for that note to be g’. Since this melody begins on e’’, it would naturally be in the phrygian mode, and it would therefore make more sense for it to end on e’, as I have done above, with previous non-resolving phrases ending on g’, thus conforming to the medieval melodic aesthetic. The distinctive sound of medieval music is due to its scales or modes giving a very different soundworld to today’s music. Medieval modes had, in principle, exclusively natural notes with the exception of Bb, like playing only the white keys on a keyboard. There were 4 natural scales starting and ending on D (dorian), E (phrygian), F (lydian) and G (mixolydian), the authentic modes; and 4 more that began and ended on different degrees, the plagal modes: A/D (hypodorian), B/E (hypophrygian), C/F (hypolydian) and D/G (hypomixolydian). Each of the 8 modes have their own tenor or reciting note, being a dominant note in the melody; and typical musical figures or clusters of notes. Therefore a mode works in a very different way to a modern scale or key signature. Not all medieval music fits this ecclesiastical schema neatly. The usual reciting note of c’’ in the phrygian mode is not present here, instead the reciting note is e’’, an octave above the finalis. Still, Mirie is broadly phrygian, since it begins on the note e’’ and, the penultimate note being f’, it would logically resolve back to e’. The insertion of this final note is based on 2 assumptions: that there is only 1 note missing from the melody, and that this note resolves to the phrygian finalis, e’. Since we have no more words nor music, no other editorial options are available. That the tune doesn’t precisely fit the phrygian mode or any other church mode isn’t unexpected. Dominican friar and music theorist, Jerome of Moravia, wrote one of the most important surviving sources of medieval music theory, Tractatus de Musica, in Paris in c. 1280, close in time to Mirie. In discussing vielle (medieval fiddle) tunings, Jerome referred to “secular and all other kinds of songs, especially irregular ones”, which appears to mean that secular songs don’t always follow the rules of musical modes as laid down by the church. Why does the commonly-sung version differ so much from the original manuscript? The now standard version comes from E. J. Dobson and F. Ll. Harrison, Medieval English Songs (London: Faber and Faber), which means it does not go back to the 13th century, but to 1979, copied and sung since by others without access to the original manuscript. We can make the following observations about the changes Dobson and Harrison made. Words. Dobson and Harrison’s commentary states that they thought the scribe wrote words s/he didn’t mean. The words in red above are Dobson and Harrison’s replacements, changed from the only manuscript copy: the 3 syllable “Mirie” they changed to the 2 syllable “Miri”, though the final e was clearly written with an individual note to sing it to; “necheth” they changed to “neheth”; “nicht” to “niht”; “murne” to “murn”; and “fast” is an editorially added last word. Changing all these words was based on 2 erroneous assumptions: that their own editing of the music is correct, and words that do not fit their version of the music must be changed away from the manuscript so they do fit; and that clearly-written linguistic variants must be ‘corrected’ and standardised, even though there was no standard spelling in the 13th century. Rhythm. Dobson and Harrison ignored all the neume shapes and instead state that they assign to the melody the rhythm of the first rhythmic mode, but they do so inconsistently, mixing the rhythms of the first and second modes, neither of which are present in or justified by the manuscript. Notes. Since “Mirie” was changed to “Miri”, deleting a syllable, the note over the final e was deleted, too. Even though the text unequivocally begins with 4 notes at the same pitch on the words “Mir-i-e it”, Dobson and Harrison didn’t believe it, thus the standard version begins with 3 notes on “Mi-ri it” instead. The effect of losing a syllable and a sung note is to put all the notes in the following phrase in a different place and in a different relationship to each other. They also assumed the scribe wrote notes with pitches s/he didn’t mean, so they changed them: where notes in a phrase were not identical to the previous phrase, they assumed the scribe was mistaken and standardised the notes. We see this throughout their process of interpretation. On my reading of the text and music, phrases are of unequal length. We expect even phrase lengths in modern music, but uneven phrase lengths are not at all unusual in medieval music: contemporaneous English songs such as Magno gaudens, 1180–c. 1230, Man mei longe him liues wene, c. 1250, Sumer is icumen in, c. 1250, and Foweles in þe frith, c. 1270, all have them. I am all for correcting errant notes where we have several original texts of music and one text is clearly corrupt when compared to other witnesses, but where we have only one witness I cannot see any justification for standardising what is not standard in the original, and where there is no evidence to suggest scribal error. The run of notes in the closing phrase, for example, is clearly the notes in my rendering. I have no explanation why this was changed for Dobson and Harrison’s now-standard version. My own approach is to trust that the scribe wrote what s/he intended to write, as well as s/he was able. In other words, I can see that the scribe wrote the music imperfectly, but I trust the scribe as far as humanly possible and edit as lightly as possible, with no attempt at standardisation where it is not justified by problems in the manuscript itself. If this is musically odd to me, I may be learning something about the difference between medieval expectations and our present-day musical sensibilities. Only when the lyrical text or musical notes clearly and obviously have missing parts or irreconcilable problems will I take to reconstruction on the basis of scribal error. 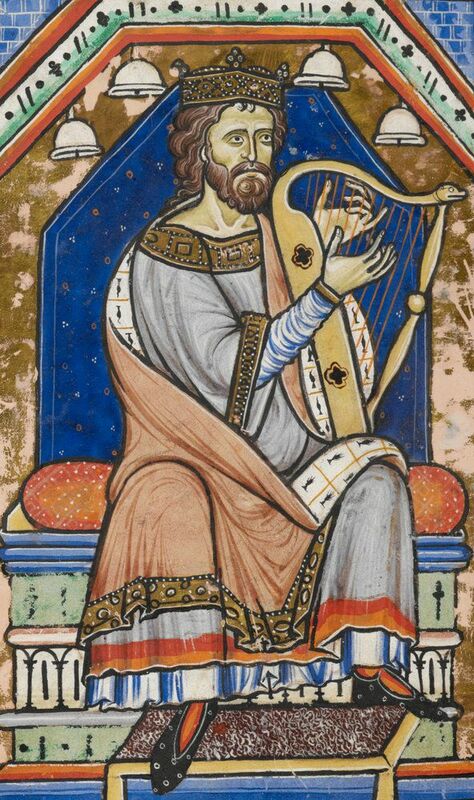 King David playing the harp, from the Westminster Psalter, c. 1200, contemporaneous with Mirie it is. We cannot know what accompaniment, if any, was intended for this song, but performance necessitates making such a decision. My chosen accompanying instrument is the medieval harp. Harps in the 13th century were strung diatonically, i.e. without a row of sharp/flat strings as on the triple harp and without the levers or pedals on modern harps to achieve sharps and flats. If the overall pitch of a song needed to be changed to suit the singer’s voice, requiring some retuning, a harp would be retuned to the appropriate scordatura (non-standard tuning) to maintain the strings’ relative pitches to each other. I have done just this myself, starting on note a’ to suit my voice rather than the manuscript’s e’’, and I have therefore flattened the B strings to restore the correct relationship between notes. I have kept the accompaniment for this song simple: on the left hand, a moving drone on the tonic and the seventh, followed by the harp descending, resulting in left hand octaves, thirds, fifths and sixths against the melody in the right hand and voice, finally resolving with a consonant fifth between the voice and harp. I am always keen for immediacy in performance, and this means an audience need to know what I am singing, therefore the Middle English verse is followed by the same verse in modern English. Between the verses, the melody is played with additional fast-running notes, a type of organum or polyphonic accompaniment. For a more detailed account of these accompaniment methods, describing how medieval music may be arranged to historical principles, see Performing medieval music. Part 2: Turning monophony to polyphony. In cases where a professional scribe wrote for an expensive bound book, medieval mensural music can be read straightforwardly from the page, with little or no ambiguity. Music like Mirie it is, in a rough hand and not professionally written, is precious because it is rare, but the price we pay is a lot of unanswerable questions of interpretation. The context of the song’s composition is also a mystery. Was Mirie a song the scribe knew and wished to write down before s/he forgot it? Did s/he copy it from another source? Was it meant to be monophonic, as written, or were there other voice parts, now lost? Are the words to the other verses lost to us because an extra page has been lost, or were the other verses already in the memory of the scribe and it was the tune s/he wanted to notate? Or was the song the scribe’s own composition? If so, was s/he yet to write the other verses? Were they ever composed? All such questions are, alas, unanswerable. Whether we take the now-standard melody, which does not always follow the notes in the song’s sole source and certainly does not follow the rhythm, or attempt to recreate the notes in the original manuscript, it’s a great tune either way. I am so glad of the fragment of the earliest surviving secular English song, giving voice to 13th century emotions, evocatively implying so much about the common experience of hardship in the coldest season of the year. I am curious as to your thoughts regarding the widespread modern practice of performing the ‘standardized’ version of this piece in canon; As far as I know there is no evidence to support that idea that the song was intended to be a round, and the new interpretation of the piece you present here does not appear to lend itself to that treatment, unlike the ‘standard’ version we are accustomed to. Hello, Angharat. It’s an interesting question you raise. Certainly there is no evidence that this song was intended to be sung as a round or canon, and my harp arrangement certainly wouldn’t be suitable for that treatment. On the other hand, there is no evidence for any particular treatment of this song, in common with a great deal of medieval music, as all we have is a single line melody. On that basis, there’s no evidence for canon, round, or my harp arrangement or any other arrangement, but I think we have to do something with it to make it singable and performable, or else sing it solo a cappella. Personally, I don’t mind what the arrangement is as long as the general musical evidence and principles (which is all we have much of the time) supports it. I’ve heard this sung as a canon and with a simple moving organum and, to my ears, both can work well for the ‘standardised’ tune. Organum would work with my interpretation of the manuscript (and is indeed the principle I’m using on the left hand of the harp) – canon I haven’t tried and I’d like to keep away from it for this rendering, so as to more clearly bring out the difference between the ‘standardised’ version and my reading of the original manuscript. Any thoughts, Angharat? I wonder if the early music revivalists that popularized the ‘standard’ version of this piece in part made their decisions/interpretations in order to guide the song into a format that can be sung as a round. I’d love to see an analysis of the ‘standard’ version showing how and where it differs from your read, and what assumptions might underlie the differences. Well, Angharat, you’ve set me an interesting challenge there that could easily be part of a revised article: the ‘standard’ version as compared with the original text. I’ve already shown the decision-making process for arriving at my reading of the tune, and it would be interesting to put that side by side with the ‘standard’ version. After all, it’s entirely likely there will be people coming to this article who don’t know the ‘standard’ version. Did early music revivalists ‘standardise’ the tune in such a way that it could be turned into a round or canon? I really don’t know so wouldn’t like to say one way or the other. Most of the versions I’ve heard have not been canons and I don’t know when that idea was first used for this song. Give me a little time and I’ll look at adding in the comparison. There you go, Angharat: done. Have a look under the section above called ‘Deciphering the music’ and you’ll see I’ve added the ‘standard’ tune with an analysis of the difference between it and my reading of the manuscript. Thank you! Excellent (and shockingly speedy) response to my curiosity. I enjoyed your article, Ian. I expect the ‘standard version’ that you refer to was mostly derived from E.J. Dobson and Frank Harrison’s Medieval English Songs (1979), as that is the most widely used modern(-ish) edition of this repertoire. However, all the songs from English sources before 1300 (including Mirie it is) are now edited in my own edition, Songs in British Sources, c.1150-1300, Musica Britannica vol.95 (2013). You’ll see that there I leave the rhythm unspecified, because I believe the original notation does not tell us about rhythm, but I’m happy to leave it up to performers to decide what rhythm to apply in performance. Hello, Helen, and thank you. I’m interested to know of your book and will certainly seek it out. Perhaps this website isn’t the place, but I’d be interested to discuss medieval rhythm more with you. Since medieval notation, of course, lacks modern time signatures and bar lines, my approach here and with ‘Bird on a briar’ (in another article) was to resolve any note value ambiguity by reference to the underlying rhythmic pulse in the implied rhythmic mode. It’s an approach I’ve found immensely helpful and informative, and has helped me make sense of some of the more indecipherable scribal notation that otherwise would be unresolveable. Of course, I come at it from the viewpoint of someone wishing to create a performable edition, so I cannot leave decisions unmade or ambiguous on the page. It seems you have a different approach and I’m interested to find out more. Fascinating! And infuriating, since what am I going to do with my ‘standard’ version now?! Thank you for posting such a thorough and wide-ranging look at the song. Contrary to Ian Pittaway and Helen Deeming, I believe this fragment shows internal evidence not just of rhythm, but of a change of rhythm appropriate to the change in emotional meaning of the words. I admit this difference is, in practice, slight. I also suspect that the original was substantially longer than this fragment, probably by another line at least. Not only does the musical phrase seem to lack more than a single note, but simply adding “Fast” sends the grammar of the text haywire. “Ilast” is a participle. “Soregh” is an adjective. “Murne” is, as shown by the “-e” syllable suffix, present tense first person singular. Adding bisyllabic “Faste” would therefore fit, but be metrically unsatisfactory as an ending, and a mismatch in the context of the closure of preceding lines. Perhaps I should declare my prejudice. In “Sumer is icumen in”, the music is primary; it is musically sophisticated (to the extent a “rota” permits/demands) and poetically competent. In “Mirie it is”, the poetry is primary; its poetic sophistication and complexity presenting a challenge that this musical arrangement fails to live up to. Personally, if asked to perform “Mirie it is”, I would want to ditch music altogether. Nevertheless, I am as intrigued as anyone as to how the fragment was rendered in its day. Thank you, Norman. Perhaps I should clarify. I do not believe, as Helen Deeming states above, that “the original notation does not tell us about rhythm”. This has been a running controversy – do ecclesiastical rhythmic modes apply only to church music or to secular music as well? Opinions and ‘fashions’ on this question have gone one way and then the other. For myself, I think it depends on context and, since there is no universal answer on any other question, I don’t see why there should be one here. For some of the earlier notation, where uniform shapes do not indicate note values, it is a more pertinent question; but where note values are clearly indicated by shape then it seems to me to be flying in the face of the evidence to ignore it and thus we are in complete agreement, Norman, that “this fragment shows internal evidence … of rhythm.” Personally, where neumes are difficult to read due to the scribe using a poor pen, I find it useful to refer to rhythmic modes, particularly in cases where the internal evidence from the rest of the music strongly suggests an underlying pulse, as here. When you write, “this fragment shows internal evidence not just of rhythm, but of a change of rhythm appropriate to the change in emotional meaning of the words”, are you suggesting a different solution to mine, or is that a comment on my solution? If the latter, I am in complete agreement. If the former, I’d be very pleased to see your alternative solution. The question of what may be missing from the fragment is an intriguing one. Alas, it’s a question we’re highly unlikely ever to be able to answer. I follow your empirical approach. I invite you to be more radical in your empiricism. Regarding rhythm, we have a conflict. The third and fourth lines (“Ej ej …” to “… wrong”) are a clear repeat, both as poetry and as music. Think couplets! As music, the second line (“oc nu … … strong”) is a repeat of the first (“-e it is … … song”), if I fill the holes appropriately and allow three upbeats ending whi-le, su-mer and fu-ghe-les in the first line. However, as poetry the first two lines appear to be very different. Forget the music for a minute, look more closely and count up syllables of Line 1 and Line 2. If we knock off the destination “song” and “strong”, they are in the exact ratio 3:2! Try adding a blank after “ilast”, putting “Mi-” as an up-beat, and then stress every third syllable starting at “-ri-”. Line 1 works, skipping along in mood suitable to merry summer and singing fowls! Now try Line 2, with all notes of equal length, stressing every second syllable starting on “oc”. It works, and it plods dejectedly like a limping man, appropriate to the doleful prospect of autumn storms. Moreover, both lines have the same framework of six stresses, with internal rhyme (-last) on the fourth and with terminal rhyme (-ong) on the sixth. If all this is not the poet’s intention, then it’s a spectacular coincidence. When it comes to the music, our arranger can’t cope. He is happy with the second couplet, repeating the musical phrase. With the first couplet, he baulks. He tries to repeat the full musical phrase, and to maintain equal length notes, and to stress every other beat/syllable throughout both lines, except for allowing extra unstressed terminal syllables (whi-le, su-mer, fu-ghe-les) an upbeat. That still leaves him two syllables to spare. He pushes them back to the begining, resulting in “Mi-ri-e it … is” being rather like a race start “Hold it, hold it … OK Go!”. It doesn’t seem to me that talk of rhythmic modes actually gets us anywhere! That may be why he couldn’t match the music to the poetry, but does it help us work it out? Norman, what a pleasure to read your workings out and yes, I can see how very well how it makes sense. It’s one of the intellectual pleasures and musical frustrations of music from medieval manuscripts that have serious difficulties – like this one – that we sometimes have to ask the intentions of the scribe: did he *really* mean what he actually wrote or was he intending something else, hampered by his imperfect notation? Of course, it can always be argued both ways and there may possibly be times when a reconstructor may arrive at a solution more elegant than the scribe had intended, or may be getting back to the original intention, which I see makes perfect sense in your solution. One thing that certainly is clear for ‘Mirie it is’ is that the ‘standard’ version sung by early music groups todays is in no way supported by the original text. Thank you for your contribution, Norman – a real pleasure. I wish I knew enough about music to understand all the comments rather than just to hear the difference. Ian, your version feels so right! [and it also puts me in mind of the music of the group Jethro Tull, I have to say]. I play the penny whistle, a very basic fipple flute, and I’m inclined to the view that if a song of the people is easy to play on basic original musical instruments, it’s probably right, and if it isn’t, it’s quite possibly wrong. I know this is a rather simplistic suggestion, but I believe my dyslexia/dyscalcula extends into reading music as I have never got the hang of it, and just play whatever I play by ear. Thank you for an extensive and erudite article! I came looking for information having heard the song played on a CD. Your dyslexia/dyscalcula (I also have dyscalcula) puts you in the same position as the vast majority of medieval musicians, who learned by ear and were expected to be able to improvise on the spot. Highly skilled, highly trained, but ‘illiterate’ in the literal sense of not reading music. Huge thanks, Ian, this was extremely interesting. I started delving into early music recently, one of the reasons is to try to understand this “different” music, with all its different rules, somewhat alien aesthetic and to see how the people of the time heard it and understood it. However I find it difficult to find the source material written in standard notation for great many songs, its often either scanned pdf of the originals (which I find hard to read as of now) or nothing at all. To have a transcribed source material is great alone, but to also have such an extensive analysis and commentary, while also debunking the set standard! It’s fascinating. As with many historical subjects you often find that your current understanding of something in the past is shaped by how you were presented with it now, and it’s usually simplified. Anyways, huge thanks for the great work! Thank you, Sandro, your appreciation is appreciated! Source material in modern notation is available in many books – once you know where to look – but, as I show in this article, it is often covered with layers of the interpreter’s assumptions which cannot always be justified from the original manuscript. For this reason, being able to read medieval notation allows us to make our own mind up. The standard work, if you’d like to learn medieval notation, is old now, but has never been bettered: Carl Parrish (1957) The Notation of Medieval Music. New York: W. W. Norton & Company.